More visibility, more matches? That's the idea, anyway. Tinder's next stab at monetization is, effectively, a queue jump system. 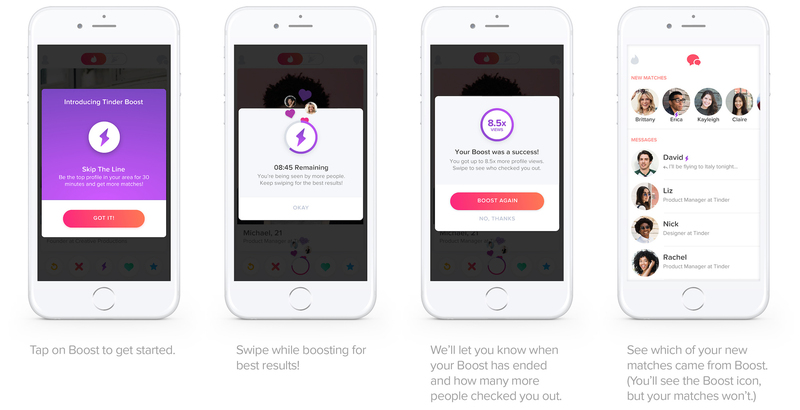 Activating a new "Tinder Boost" will turn your account into a "top profile," helping you to "skip the line" for 30 minutes. The idea is pretty simple -- Boost and you'll head to the front of everyone's queue, increasing your visibility and the likelihood of a match. If you have a Tinder Plus subscription ($9.99 or $19.99 per month, depending on your age) you'll get one "free" Boost every week. Any user can also buy Boosts individually. Tinder is testing the feature in Australia, and hopes to roll it out worldwide "soon." The option could be divisive given it provides an advantage to people with deep pockets, rather than those who might be a better match for people in their local area. Premium, or promoted profiles are a common feature on dating sites, however, so this isn't really a new idea -- just one that's been re-engineered for Tinder's swipe-based matching system.